Remember the Sony Rootkit fiasco not so long ago? “The supervisor who spoke with me was not sure how this software ended up in the new laptop thus put me on hold. He confirmed that yes, Samsung did knowingly put this software on the laptop to, as he put it, ‘monitor the performance of the machine and to find out how it is being used.’"
SBS 2003 – SBS Network Configuration Wizard Error–Logon Name and Password Wrong? We had set up three identical Toshiba Tecra S11 laptops with Windows 7 Enterprise x64 and all of the necessary drivers prior to delivering them to our client’s site. When we first fire up the laptops we jump into the BIOS to enable vPro, set date and time, enable Intel Virtualization, and other BIOS related features. The system could not log you on. Make sure your logon name and password are correct. We tried all known good username and passwords with no results. With some help from fellow MVPs it turned out that somehow the laptop’s time and date were not in sync anymore. Time was not the first place we checked since all three laptops were set up at the same time with the same settings. So, how the date and time on that one laptop fell out of sync is a mystery. But, once the date and time was set correctly we were able to join the SBS 2003 domain! Microsoft Software Assurance Interactive Benefits Chart (PDF Document). We sell Open Value Agreements into almost all of our client sites for desktop OS, server OS, and Office. Add MDOP to SA for desktop OS and there is a huge value there. We have made no secret about our support of Jeff Middleton’s Swing methodology here. There are many times where the skills learned by following the Swing Migration documentation to Swing SBS from one box to another have come through to save a client’s SBS environment after a catastrophic failure. Since many SBS environments are single server or single DC, the Swing methodology teaches us a lot about how to either move AD and all of the bits with it or to recover AD and all of the bits with it. We also learn that introducing another DC into the mix brings about a unique environment for recovery that is unique to SBS. Many of the skill sets learned are out there somewhere, however one of the principle benefits of the SwingIT Kit is Jeff’s ability to pull all of those disparate resources into one organized place for us to work through. Jeff also includes many tools and scripts to facilitate a clean migration from start to finish. And one final point, the Swing method provides a fall back for the migration process where the Microsoft method does not once mailboxes have begun to move.
. . . it really does get difficult to work through all of this for those that may not spend time working directly with hardware. Since we build our own servers and have been doing so for a good 12-15 years now we know the hardware side of things quite well. We also resell tier 1 for remote clients though we don’t like the $*?$! match between them and software vendors when things break. Again, given our hardware experiences we can bring both in line most of the time and get a fix. For virtualized environments more sockets + cores is better. All VM threads are processed in parallel for 2+ vCPUs. Hex-Core CPUs hit a sweet spot for virtualized setups where 4 vCPUs are assigned to several VMs. For physical environments more GHz is better. We use Intel Xeon CPUs exclusively. YMMV. More RAM is always better. Hardware RAID is a must. PCI-E 8x 2nd Gen is better. Battery Backup or SSD Cache is better. 15K 2.5” spindles is better than 15K 3.5” spindles. SATA is only Nearline storage and never for primary production I/O. SSD blows away any and all spindle based setups. That about sums up the overall perspective we have on server hardware. Using the above guide we are able to start with a base platform that is tailored to a client’s needs and then scale up from there. In addition to the above, we can add redundancy features such as multi-port server NICs, additional power supplies, clustering configurations, and more. In the end it is our aim to provide the best all around IT solution for our client’s needs. While out and about whether travelling to or between clients, or working at a client site we always use a cellular modem to connect to the Internet. There are times when there is a need for more than one Internet connection that is provided by a USB cellular based modem. In the US, and perhaps other locations, folks have access to a small wireless device called a MiFi (Wikipedia) or mobile Wi-Fi. Up to recently we here in Canada have not had such a device available by our mobile carriers. Since our switch to Bell Mobility to gain access to the HTC HD7 for a new phone we called a number of different Bell stores in the Greater Edmonton Area to purchase a Novatel MiFi unit that is listed on their Web site. All of the stores indicated that they had no stock and are no longer carrying them. Bell’s customer service rep that we spoke to indicated that they were having too many issues with the MiFi unit so it was pulled. So, we headed down to our local TELUS store and picked up a Huawei E5836 Mobile Wi-Fi device. Once we fired it up we were able to connect to it using the default WPA code that is on a sticker on the back of the unit. We then opened a Web browser and navigated to http://e5.home. We side-stepped the Quick Setup wizard and went about configuring our desired subnet, SSID, WPA2 key, and other settings. The unit was really easy to set up and use. One feature with regards to the screen that is appreciated is its ability to indicate the number of clients connected to the unit. We anticipate having a laptop or three, the Tega, and perhaps the Zune HD connected simultaneously. This post was published using the cellular data connection provided by the E5836. While at the MVP Summit those of us in the SBS and WHS specialities received a gift from HP. That gift was an HP ProLiant MicroServer with a 250GB hard disk and 1GB of RAM. The server board sits on a tray that is held in place by the two blue thumb screws. Once we slid the tray out we had full access to the RAM slots along with the two PCI-E slots that allow us to install a half height half length add-in card. We installed the two 4GB ECC DRAM DIMMs to bring the server’s RAM up to 8GB because the 1GB just was not cutting it with Windows Server 2008 R2 Standard. Note that there is no hot swap backplane in this unit so any hard disk maintenance needs to be accomplished with the server offline. When installing an optical drive or an addition set of hard disks the mounting screws are located in the front door panel. Optical drive screws and hex key tool. Hard disk drive mounting screws located in the front door panel. This unit is _really_ quiet. It is quite suited to sitting on or under a desk somewhere in a small office with no one ever knowing that it even exists. We are inclined to see the MicroServer as a the platform of choice for the small 5-10 seat office with the Microsoft Windows Small Business Server Essentials 2011 operating system. Or, the MicroServer makes a great standalone DC for those clients that we are setting up with a simple two node DAS based Hyper-V cluster. One thing to be mindful of when it comes to the out of the box configuration is that the on board software RAID setup is quite limited for bandwidth. So, a fairly active engineering or architectural firm that is moving a lot of data from a single point may not benefit from this box without an add-in RAID controller. We have just finished replacing our file server that was running on Windows 2008 Standard Core. Replacing that server was not high on the priority list until after our migration to SBS 2011 RTM when we had a Group Policy setting that enabled UAC for the OU that contained our Core and Hyper-V Server installs. We restructured our GP scopes and OUs to eliminate UAC on our Core based servers. By default, UAC is disabled on Server Core. All of our Core, Hyper-V Server, and cluster node servers took the settings changes that disabled UAC without an issue. But, the file server for whatever reason decided to ignore the GP settings and keep UAC enabled. Try as we might we ended up with a Group Policy Tattoo for UAC thus rendering the server in a bad state. We decided to cut and run so we reloaded it with Windows Server 2008 R2 Standard Full. The benefits of having the full install are huge. We now have access to the Windows Search service which allowed us to key in all of the shares on the file server into the Windows 7 Libraries feature and thus local search results. We were able to mount the original server’s backup and attach the backup VHD to recover the needed folder share data. The utility is the Enhanced Print Troubleshooter developed by the Decision Theory Group at Microsoft Research and Microsoft Product Support Services (PSS). We will now be able to create and run reports that will allow us to see the big picture on all of those dormant files as well as other files and their usage on the server. Since we have well over a Terabyte of data to sift through we are anticipating freeing up a lot of storage space! We are going to do our best to get in on the Quarterly Licensing Brief call as we have a number of SPLA and SPUR related concerns that we need to express. Microsoft Hosting: Quarterly Licensing Brief on March 17th at 9:00am-10:00am PST. We will also try to get in on the April 21 Hosting Community Call to see if we can express some of our licensing structure concerns there as well. Microsoft Hosting: Hosting Community Call April 21 at 0900Hrs PST Pre-Registration. While the method outlined in the post yesterday does indeed get the machines up and running, it does so by possibly leaving the operating system in a questionable state. We have used the method to bring about productivity on the affected users with the caveat that at some point we will need to revisit those machines when the users are not so busy. Note the comments section that indicates how folks have been able to bring back the problematic machines or not. To help Microsoft support please e-mail us a link to a ZIP archive of the above that has been uploaded to a SkyDrive location and we will forward that link onto Microsoft Support. The more dead bodies we can get to Microsoft the quicker a fix or at least the source of the failure will come to light. 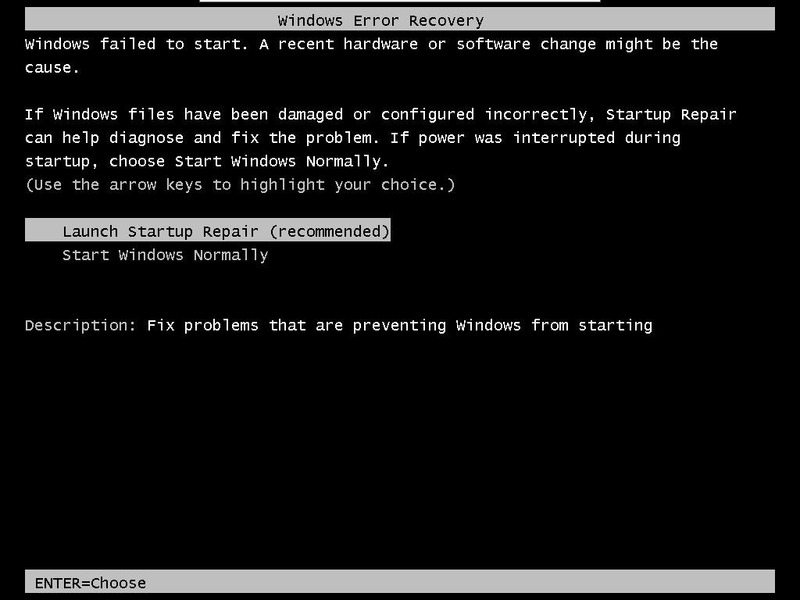 Microsoft Windows site: What are the system recovery options in Windows 7? Microsoft KB 975484: Your computer may freeze or it may restart to a black screen that has an 0xc0000034 error message after you install a Windows Vista service pack. Microsoft Download: Microsoft System Readiness Tool for Windows 7 x64 (64-bit). Microsoft Download: Microsoft System Readiness Tool for Windows 7 x86 (32-bit). UPDATE: Missed the \Sessions\Sessions.xml in the above folder pointer. While the methodology below works to bring the machine back, its state after the fact is questionable. Answer was provided by thiswoot. 01. Reboot your computer while it's starting up. 02. When your computer starts up again, choose the option "Launch Startup Repair"
04. After you click cancel it will show a box. Click "Don't Send"
05. Click the link "View advanced options for recovery and support"
08. Notepad will open. In notepad go to File-->Open. Your PC might not have all 3 sections of code (<Checkpoint>, <DeleteFile>, <MoveFile>). Just make sure you delete section "Checkpoint" and whatever other sections have "000000000000000.cdf-ms". They will be right next to eachother. Once your computer starts up, do a normal startup (it may stall for 5-10 minutes at the "starting windows" screen, but leave it going) and the Service Pack will install some more stuff and restart a few times and then everything should be working! For some people, it reverts everything and cancels the service pack installation. For other people, the service pack installation completes. Either result is fine. We are starting to see dead bodies as well and will use this method to restore the machines to working order. Note that the Pending.XML file may change its permission state when edited and cause the revert to fail. Check the file attributes both before and after making the necessary changes. Microsoft Windows: Troubleshoot problems installing a service pack for Windows 7. We had a few calls this morning with clients having problems with their machines due to Windows 7 Service Pack 1. While working from a client location we sometimes need access to the audit notes that we keep on all of our clients. Those notes reside in a secure SharePoint Foundation site. It can take time to fire up the Tega v2 or the Tecra laptop to get into our SharePoint libraries. Two feature discoveries were made this morning that made the payback on the HTC HD7’s purchase readily apparent. SharePoint integration is seamless with the ability to pin the site to the Start Menu. Quick access is really important when working on something critical. Microsoft Office documents have quick access features like Outline View. Tap the Outlook View button in Word after opening the document and navigate to the needed information quickly. When the document is opened on the HD7 the Outline view looks just like that. We can then tap on the required heading and be brought to that point in the document just as we do within Word 2010. From a Microsoft e-mail that is applicable to Open Value Agreements that by default would have an automatic shipment of new product versions to the agreement holders. Microsoft is committed to evolving its business practices to better support you as a Volume Licensing customer. Based on improvements in internet access and customer feedback we want to inform you of an important upcoming change in how we will deliver products to you in the future. As a Microsoft Volume Licensing customer enrolment no. AGREEMENT#; you receive Microsoft software updates through a physical media subscription kit. Beginning in April 2011, we will convert your physical media subscription to digital delivery through the Microsoft Volume Licensing Service Center (VLSC). This means we will stop sending you physical CD/DVD software updates. You will be able to access your updates by digital download on the VLSC. In April 2011 you will receive a confirmation e-mail for each Volume License agreement enrolment which is converted to digital delivery and after which all future media subscription kit shipments will end. We will also send you instructions about how to access your updates on the VLSC. Note: MSDN , Software Assurance or any additional media subscriptions that you have paid for will not be affected, these will continue to be sent to you. If your organization is unable to take advantage of downloading from VLSC, due to internet access limitations, or other factors, and you prefer to continue receiving your updates by CD/DVD media, please indicate this before 15 March 2011, by CLICKING HERE. Thank you in advance for recognizing the importance of online software delivery. Since 2008 our "Digital by Choice" campaign has helped many customers move to software downloads. With software downloads you help reduce the need to manufacture, ship, and ultimately dispose of disks; you get updates more quickly as you can download them immediately; and you help yourself save time and resources as you do not have to manage the receipt, cataloguing, distribution, archiving and disposal of disks. Note that there is a deadline for the digital delivery opt-out of March 15, 2011. So, for any OVL clients that have ultra slow ISP connections or none at all they will need to make sure that they opt-out of digital only before that date. My old HTC Touch Pro died this last weekend. So, despite wanting to wait until the summer before picking up a new Windows Phone 7 based device my hand was forced. After evaluating the three main cellular provider’s Windows Phone 7 (WP7) devices I settled on the HTC HD7 offered by Bell Mobility. Discontinued our longstanding TELUS Mobility (TELUS) service (previous blog post on some of the pain points with them). Replaced the now dead HTC Touch Pro. Now, since I have had a Zune HD since last year that gets used a lot the Metro GUI on the HD7 has been pretty straight forward to get used to. The screen is huge, clear, and rich in colour compared to my old HTC Touch Pro. Exchange configuration was very straight forward. The integration between Outlook, Hotmail, Facebook, and other social media sites is amazing. In Phone mode the screen blanks when the phone is at the ear but immediately goes active when the phone is taken away from the ear. The phone did require an update right from the start. In order to do that though the Zune software was required. Once the Zune software was up to date we were able to move forward with updating the phone. Once the phone rebooted it came up into an update mode with an icon of a laptop tethered to a Windows phone. There was a progress bar that ran up the left hand side of the phone’s screen. I was not able to watch the update complete, but the first third took about 10 minutes. The progress bar then sat there for quite a while. Once completed, the phone was sitting at the lock screen. The approximate time for the update was about 30-45 minutes. Make sure that the server is running and your session has not timed out. If you can reach the server but cannot log on, make sure that you provided the correct parameters. If you are experiencing network issues, contact your system administrator. Well, none of the above seemingly turned out to be the problem. For whatever reason the SEP Manager was not running. Once started the management console opened with no issue.